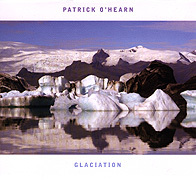 On Glaciation (43'15"), Patrick O'Hearn applies his many musical talents to the ambient genre. When compared to earlier works this CD is quite subtle, but perfectly expresses the magnificent desolation of the icebound regions at the top of the world. Using piano, electric bass and guitar, plus lush synthesizer pads and gentle percussion, O'Hearn renders 13 tracks - ranging from the still forms of sound collage to majestic and reverential odes to the earth. No matter how minimal or quiet, O'Hearn's stamp is on every song. His sophisticated compositional sensibilities help transform our ideas about the arctic from those of a lonesome unnamed landscape to that of a beautiful blue realm of water, ice and sky. The ecological message comes through as well. Along with a reverence for nature is concern for the survival of this pristine polar domain.